It’s been a long time since the last update, hasn’t it? We’re often asked if we’re still alive or if the project is still maintained. Truth be told, for the past 1.5 years we’ve been hard at work for a brand new release. Since our first release in 2012, we’ve been constantly amazed by your designs. Not only once we’ve scratched our heads and wondered “How did they do that? Moqups can’t do that yet!”. We’ve seen you improvising, pushing the app to the limits, way beyond the quickly get-that-idea-out-of-your-head concept we started with. We’ve got tremendous feedback and feature requests from our community, continuously validating an emerging pattern: many of our users wanted to go from low-fidelity wireframes to high-fidelity mockups, without having to switch between apps. Can we do something to help? 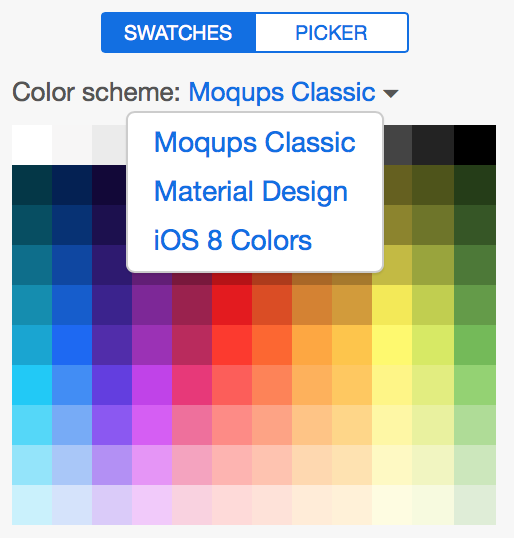 — Now, developing an app like Moqups is far from being an easy task. No matter the programming language or framework you’re using, dealing with so much complexity won’t get your team too far. Doing this in a web browser is even harder. Browser compatibility shenanigans, performance bottlenecks, unpredictable network conditions and whatnot. When we wrote the first version of Moqups, we relied heavily on the tools and libraries created in a time when the web, as an app platform, was still in its infancy. A lot has changed since then and the web we know today is more mature and fully capable of delivering great user-experience and performance. After pondering with many refactoring strategies (and ditching every one of them), we realized that in order to push things forward,we needed a new foundation with an architecture that makes complexity manageable and allows us to move faster. Complete rewrites are against conventional wisdom in the software industry but we’ve done crazier things before. Resizing multiple objects and groups is now a breeze. Also, you’re no longer forced to unwrap a group to access and modify the contents inside it. Yeah, that annoying task of grouping-ungrouping-grouping objects a gazillion times is no longer necessary. Simply double click a group to access and modify its contents. Click outside to exit the group hierarchy and presto! Drag the circle handle to rotate one or multiple objects. Hold Shift to rotate in 15˚ increments. This was one of the most requested features and probably the hardest to implement. Eliminate monotony from your designs with a choice of more than 600 web fonts integrated in the new app. Bonus: More advanced typographic settings like letter spacing, small caps/all-caps and strikethrough. Customize the radius for individual corners in rectangles. Sharp, round, just a little bit sharp, just a little bit round… you’ll love this one! This is self-explanatory. Make your objects stand out from the crowd with a touch of shadow. Who said you need surgical graphic skills for creating complex shapes? Create arrows, callouts, polygons, stars, wedges in less than a jiffy! With the current flat design trends, having the right icon for the right action is extremely important. That’s why icons have a special place in the new release. We’ve integrated the most popular design packages and more are on the way. Font Awesome, Material Design, Hawcons or Entypo. Drop us a note if you’d like to see your favorite package integrated in Moqups and we’ll take a look! Hat tip: Replace icons by simply dragging and dropping on top of another icon. Customize the default theme of your project. Select your favorite colors, fonts and other style settings for keeping a consistent look & feel across your project pages. We’ve received a lot of feedback on this topic during the beta period. Some users are in the middle of huge projects and some just want to take their time to do the switch. We do realize that adjusting to something so different takes time and most of all, we want to avoid disrupting your work in any possible way. The old app is now Moqups Classic. You can still find it under the old address for now (http://moqups.com ) . We’ll be supporting it for as long as it is used by a significant number of users. You can use both apps in parallel on the same account and subscription. You can easily migrate the projects created in Moqups Classic to the new version. As always, your amazing suggestions are helping us make Moqups a great product. This is only the beginning. We can’t wait to show you what’s in store for 2016 and beyond!